In today’s digital context there are many new ways of providing, creating and distributing content as well as new ways to generate value. In order to ensure that copyright and licensing stay fit for purpose in this world, the European Commission started a stakeholder dialogue titled Licenses for Europe. 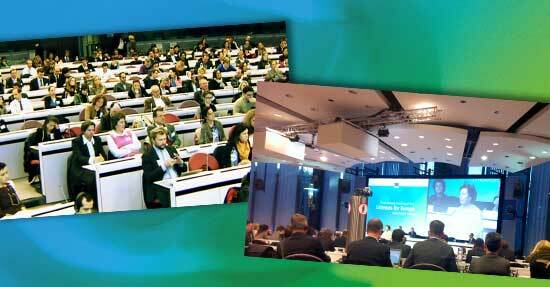 Its main purpose was to deliver “rapid progress in bringing content online through practical, industry-led solutions.” The initiative held its final plenary session on November 13th in Brussels. Participants of the dialogue included representatives from interested parties such as consumer and digital rights organizations – and the topic touches on the lives of many. IT and technology companies, internet service providers, film heritage institutions, broadcasters, public libraries, authors, producers, performers and other copyright rightholders in the audiovisual, music, publishing and video game industries all took part. However, as the European Digital Rights Initiative (EDRI) points out, after 10 months of debate, there is little consensus between these different stakeholder groups as to how to make EU copyright fit for the digital age in law and in practice. The final plenary meeting provided an opportunity for the different working groups to report-back to the plenary on their conclusions. The main critique of the EDRI is that in the process, all attention went to establishing relationships between rights holders and platform developers – thus excluding other approaches and larger attempts at a much needed copyright reform. In their words: In the current technological environment, copyright affects ordinary citizens and many professionals, such as teachers and cultural heritage professionals, that are not represented by the two industries that Commission’s approach suggests are the only legitimate stakeholders. There are user rights at stake in this discussion that are extremely important in fields other than popular culture, in particular in education, but also for political expression and democratic participation. At this final meeting, moderator Norman Jardine invited the four thematic working groups each in turn to introduce their results and outcomes. From Working Group1, which has worked on cross-border access and portability of services, the sub-group of Print — represented by Fabian Paagman — was the first on the floor. Fabian introduced a roadmap by e-book sector on improved availability of e-books across borders and across devices. Their statement is available to read here. Bertrand Moullier from IFTA represented the sub-group Audiovisual in WG1 and talked about cross-border portability of subscription services, introducing a joint statement by the audiovisual industry. Gradually offered cross-border portability would make it easier for consumers to legally access films and TV programmes from their home member state when travelling abroad on holidays or business trips. The representatives of this sector (twelve organisations) affirmed their willingness to continue to work towards this. Working Group2 has worked on user-generated Content and Licensing for Small-scale Users of Protected Material. Frances Lowe, representing PRS for Music and GESAC, talked on what kind of commitments the music sector has made on easier licensing for music. So did Olivia Regnier from IFPI, who announced a pan-European licensing scheme for small-scale users. Anita Huss-Ekerhult from IFRRO introduced a toolkit solution proposed by the rights holder communities in the print industry for licensing including micro-licensing in text and images works. You can find this toolkit here [PDF]. The next speaker from WG2 was Angela Mills Wade from EPC, with a pledge to enable the identification of your work and rights online. This introduced roadmap enables creators to attach a machine-readable identification to their content, which helps using and re-using content. Sarah Davis, commercial legal director of the Guardian Media Group introduced a declaration on improving the user experience in the digital environment, that is: How to involve readers more actively in online press. After these pledges the time had come for presentations. Paul Keller from Kennisland voiced a critical opinion on the results of WG2 and drew attention to the difference between licensing and creating user rights. After Paul we heard two presentations on user-generated content: from the perspective of YouTube from the European IP Policy Manager of Google, Tobias McKenney, and from the perspective of Sony ATV’s Antony Bebawi. Nicola Mazzanti, president of ACE talked about the agreement on principles and procedures between rights holders and European film heritage institutes, pursuing the goal of getting more heritage films online. This statement was signed at the end of the plenary meeting. With this statement, film heritage institutions and film producers now have a clearer agreement on how to go about digitizing, restoring and making available European film heritage without requiring changes in legislation. Nicola Frank from EUscreenXL partner EBU introduced the discussion between public broadcasters and rights holders on freeing up TV archive footage through digitization. Considering that we have to count on a myriad of rights holders, clearing the rights makes the use of such materials highly expensive and time-consuming, so participants agreed to find solutions. James Taylor, communications officer of the SAA introduced in a pledge the audiovisual industry’s declaration to improve the identification and discoverability of audiovisual content online. The parties here declared to make current standards interoperable and to use them widely, which should help streamline their distribution. The fourth working group focused on Text and Data Mining. Here only Eefke Smit from STM talked about the scientific publisher’s commitment on easier text and data mining of subscription-based material for non-commercial researchers. As a solution, publishers proposed a licensing clause, a “mining portal” and a “click-through license”. After these pledges and presentations, the three commissioners — by whom this dialogue was jointly led — evaluated the results of the dialogue. All of them mentioned that first of all, practical solutions were required. Vice-President Neelie Kroes (Digital Agenda for Europe) expressed her gratitude for the stakeholders’ workmanship. At the same time, however, she expressed that she did not consider the achievements of the stakeholder dialogue conclusive. As an exception, she highlighted the fruitfulness of working group 3 on audiovisual heritage. Ms. Kroes stressed that this nine-month-long project was only the first track in the process and results of it will feed into an ongoing track: the legislative review. She committed that Commission will seriously consider all possible legislative proposals. Commissioner Androulla Vassiliou (Education, Culture, Multilingualism and Youth) also stressed that parallel work is necessary: stakeholders’ dialogue and legislative review. She said users need more clarity and transparency both on their rights and their obligations. Like ms. Kroes, Commissioner Vassiliou zoomed in on the results from the audiovisual heritage working group. She said this agreement opened the door to one million hours of European film works. She also mentioned the joint agreement on the cross-border portability of subscription services as a remarkable achievement. Commissioner Michael Barnier (Internal Market and Services) said that ”we need more single market on the Internet and more Internet on the single market” and he mentioned a recent economic study according to which the creative industry creates more jobs in Europe than the car manufacturing industry does. Commissioner Barnier announced that a final decision on a review process will be taken in spring 2014. With this final plenary meeting, the Licences for Europe dialogue came to an end. The Commission will follow up more specifically on some of these initiatives, such as the agreement to carry out an ad hoc dialogue on broadcasting archives, where further work will have to be carried out as a result of Licences for Europe. In all cases, the Commission will continue to provide information on the state of implementation of the different initiatives. The Commission is currently working on an Impact Assessment and in this context will shortly launch a public consultation on the on-going review. In EUscreenXL, we recently closed our first stakeholder survey, directed at collections managers and legal experts. It was held to obtain a pan-European overview of the difficulties memory organisations and audiovisual archives experience when they decide to bring their collections to the web. Together with Europeana, we plan to hold an IPR-focused workshop in early spring in order to develop the policy and advocacy steps the audiovisual heritage domain can take to improve the public’s access to audiovisual sources through the web. Read the European Digital Rights Initiative’s response here. The lists of participants in the four working groups are available on the Licences for Europe website. To get all the details of the session, it is worth it to watch the full video stream. To read more about the participation of the cultural heritage field in the Licenses for Europe trajectory, read Réka’s report on Second Europeana Licensing workshop.